Lately I have spent much energy and time for cleaning both old and new temple buildings because today we have a O-Bon service. 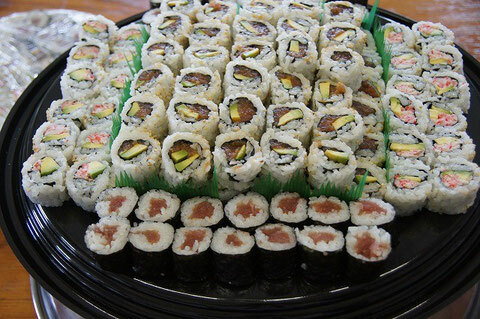 And now I'm going to make Sushi for the refreshments after the service. I don't think it's necessary for a minister to prepare refreshments. But I want to try the best I can while I could have time to do. This is because of my realization of my death. Of course, I am young. I don't think I die tomorrow. But who knows? or who can say for sure I can live tomorrow? I truly realize I don't know I can live longer. That's why I want to work very hard, today at this moment. I think I'm a greedy man. because I always wish to be a good person. I am greedy I want to be kind to every single person I meet. I am greedy I want to study more. I am greedy I want to help those who needs to help. I am greedy I want to be a useful, compassionate, kind, interesting minister. I think these are very reasons why I am a minister. At the same time they are the ones why I write blogs. Thank you very much for reading this blog!! !